Duracell’s design is famous the world over, and the Battery Alarm Clock Radio here takes after that well-known design. It doesn’t provide any power though, instead it relies on a couple of AAA batteries to work. 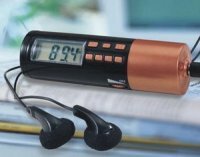 In addition to an alarm clock, you also get an integrated FM radio to help you stay awake during those boring lectures at class.